The kimono is an iconic garment. The ultimate signifier of Japan, it is revered within the country as the embodiment of national culture and sensibility, and internationally regarded with exotic fascination. 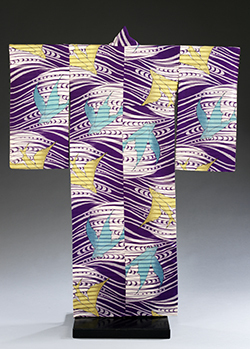 This symbolic status and the fact that the basic shape has remained relatively consistent over the centuries, means that the kimono is often viewed as a simple, timeless garment. It is ‘traditional’, while ‘modernity’ and by extension ‘fashion’ is a western phenomenon. This lecture will present the kimono, not as static and unchanging, but as a highly dynamic and fashionable item of dress. It will reveal the sartorial and aesthetic significance of the kimono in historical and contemporary contexts, both in Japan and in the West where its impact on dress has been felt since the 17th century. Anna Jackson is Keeper of the Asian Department at the Victoria and Albert Museum. She has particular responsibility for the Museum’s collection of Japanese textiles and dress, a subject on which she has published widely. Her latest book, Kimono: The Art and Evolution of Japanese Fashion (2015) focuses on the Khalili Collection, one of the most important private collections outside Japan. Anna’s other major research interest is the cultural relationship between Asia and the West and she has contributed her expertise to a number of V&A exhibitions and their related publications including Art Nouveau 1890-1914 (2000) and Art Deco 1914-1939 (2003). In 2004 she was co-curator of the V&A exhibition Encounters: the Meeting of Asia and Europe 1500-1800 and in 2009 curator of Maharaja: the Splendour of India’s Royal Courts, which subsequently toured to Germany, North America and, in revised form, to the Palace Museum in Beijing in 2013.